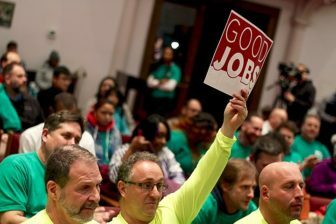 New Haven’s labor unions flexed their political muscle to back MGM Resorts’s proposed casino in Bridgeport, as a showdown begins over tribal nations’ competing plans. At a rally Feb. 6 at UNITE HERE’s hall at First & Summerfield Church on Elm Street, three mayors, four state legislators (two of them Republicans), a gubernatorial hopeful, nine alders and a crew of workers from other MGM properties spoke about the jobs that a resort casino could bring to the region. Betting on a strong market in Southern Connecticut, with its access to trains from Manhattan and ferries from Long Island, MGM has proposed building a $675 million, waterfront casino in Bridgeport. A casino there has been an ambition for multiple developers, including Donald Trump. The company has also agreed to open a workforce development center in New Haven, where 2,000 employees would be trained. “This resort will need people who handle money and luggage; people who plan menus, prepare the food and serve it; people who buy advertising; and people who manage the payroll for all those jobs,” Mayor Toni Harp said. 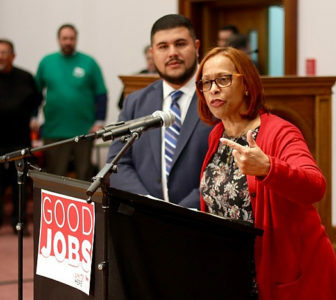 The partnership deals New Haven into the pack with Bridgeport as a political team to work alongside UNITE HERE in Hartford, where a legislative showdown against Native American tribes will take place. At Tuesday’s meeting, Bob Proto, UNITE HERE — Local 35’s longtime president, announced that he has struck a neutrality agreement for the proposed casino. Essentially, that means MGM, which already works with UNITE HERE at 27 hotels like the Bellagio and Mandalay Bay on the Vegas Strip, won’t interfere with organizing employees at the new project. So workers would have a union and earn living wages and benefits. The room was captivated by testimonials from current MGM employees, who traveled from other properties in Detroit, Atlantic City and Washington, D.C., to speak in New Haven. Tuesday’s rally was timed with the announcement Tuesday of a new state bill, expected to be filed this week, that would establish a competitive bidding process for a casino license. The bill also repeals last year’s approval of a gaming facility in East Windsor. That casino was intended to compete with MGM’s new resort across the state line in Springfield, Mass. State Rep. Toni Walker, D-New Haven, addresses the rally in support of the Bridgeport casino plan. New Haven State Rep. Toni Walker, the bill’s co-sponsor, said that the federal government has held up approval of the state’s latest gaming compact with the tribes — after MGM’s private campaign by two high-powered lobbyists — creating a delay that Connecticut and its shaky financial outlook don’t have time to wait out. The state would need to pass the competitive bill in order for MGM to even pursue permission to build the first commercial casino off tribal land in the state. Another bill would be required to actually give them the license, and that would come with a price tag. If that happens, a longstanding state deal giving the tribes exclusive rights to run casinos would expire, along with the government’s share of slot machine revenues. That payment was worth $264 million last year, way down from the peak of $430 million a decade ago. MGM is promising that a Bridgeport casino would bring in more revenue; its political proponents are basically making a bet that that will be true. 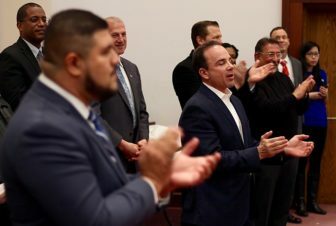 Republican State Sen. George Logan and Shelton Mayor Mark Lauretti (back left) join Democrats, like State Rep. Chris Rosario and Bridgeport Mayor Joe Ganim at the event. As gambling expands in neighboring states, some critics have questioned MGM’s end game: Is the company ready to open a casino in Bridgeport, or does it just want to crush the competition along the Massachusetts border? MGM said it’s all in. “We look forward to pursuing this opportunity as soon as the bill passes,” Clinton said in the statement. “We are fully prepared to present a compelling proposal that will create thousands of jobs, boost the state’s economy and drive tourism, offer significant opportunities for local businesses, and provide substantial revenue to the state and its municipalities. And we continue to believe that Bridgeport is the best location for a commercial casino … to achieve all of these objectives. Some have criticized the idea of promoting casinos as economic development, in part because they promote gambling addiction.